Abstract SheNANigans: RYLEE SAGE TURNS 4! Ever since my granddaughter Rylee was born on New Year's Day four years ago our lives have revolved around her on the 1st day of the year. We joke about how popular she is because so many family members want to take care of her that we have to ask her to "pencil us in". I still remember the time when the light bulb turned on in my dim brain while I was at work and realized my nineteen year old daughter could be pregnant. I had just driven her past Starbucks and asked if she wanted one of those Venti Caramel Macchiatos and she refused. How odd, I thought. And as I sat there at my desk I also realized that my daughter didn't smell like cigarette smoke which should have convinced me immediately but I was still in denial. I did NOT want my child to perpetuate the cycle of teenage pregnancy I began. But four years have passed since then and our lives have been enriched by the presence of Miss Rylee Sage. She's the little buddy I take everywhere, the little voice that tells me I don't know everything, and the living reminder that unplanned pregnancies are priceless treasures. I've watched her dissolve the most hardened of hearts in the male species, like my dad and Ray to name a few. When Ray and I began dating he was forthright in letting me know how he has no kids for a reason, never wanted any for himself, and didn't want any at all. I secretly laughed at him then because I wasn't trying to foist my granddaughter on him and you can bet that I was NOT looking for a baby daddy! But once they were acquainted they became each others' buddy and the depth of his love for that little girl almost rivals my own. Although she's not perfect and could be the bossiest and most know-it-all little girl in existence, she continues to bring humility into my life. The simplicity of her reasoning breaks me down into a sheepish human being. I was experiencing one of my silent rages recently when Rylee's keen sense compelled her to approach me and say, "God is in us. He's in us, Gramma." And I silently stared at her with a shamed face as she climbed on my lap and hugged me. This year, courtesy of Auntie Lu and Stefano, we held an impromptu ice-skating venture for the birthday girl. Her first time on the ice and she loved it! Happy Birthday to my granddaughter, Rylee Sage! Thank you for providing a channel to pour forth the love especially reserved for granddaughters! My life will always be strung with colorful, kaleidoscopic lights because of you! 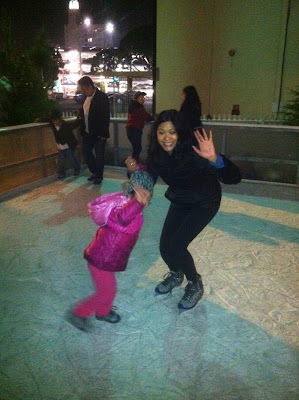 Mommy and Rylee workin' the ice! Auntie Lu and Rylee hammin' it up! Birthday girl scored at PF Changs! Freezing cold, tired, but happy!